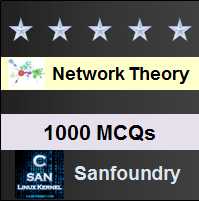 This set of Network Theory Multiple Choice Questions & Answers (MCQs) focuses on “Inter Connection of Two-Port Networks”. 1.In the circuit shown below, find the Z-parameter Z11. Explanation: The Z –parameter Z11 is V1/I1, port 2 is open circuited. V1 = (1+2)I1 => V1/I1 = 3 and on substituting, we get Z11 = 3Ω. 2. In the circuit shown in question 1, find the Z-parameter Z12. Explanation: The Z-parameter Z12 is V2/I1 |I2=0. On open circuiting port 2 we obtain the equation, V1 = (2) I2 => V1/I1 = 2. On substituting we get Z12 = 2Ω. 3. In the circuit shown in question 1, find the Z-parameter Z21. Explanation: The Z-parameter Z21 is V2/I1 |I2=0. On open circuiting port 2, we get V2 = (2)I1 => V2/I1 = 2. On substituting we get Z21 = 2Ω. 4. In the circuit shown in question 1, find the Z-parameter Z22. Explanation: The Z-parameter Z21 is V2/I2 |I1=0. This parameter is obtained by open circuiting port 1. So we get V2 = (2 + 1)I2 => V2 = 3(I2) => V2/I2 = 3. On substituting Z21 = 3Ω. 5. In the circuit shown below, find the Z-parameter Z11. Explanation: The Z –parameter Z11 is V1/I1, port 2 is open circuited. V1 = (10 + 5)I1 => V1/I1 = 15 and on substituting, we get Z11 = 2.5Ω. 6. In the circuit shown in question 5, find the Z-parameter Z12. Explanation: The Z-parameter Z12 is V2/I1 |I2=0. On open circuiting port 2 we obtain the equation, V1 = (5) I2 => V1/I1 = 5. On substituting we get Z12 = 5Ω. 7. From the circuits shown in question 1 in question 5, find the combined Z-parameter Z11. Explanation: The Z-parameter Z11 is Z11 = Z11x + Z11y and Z11x = 3, Z11y = 15. On substituting we get Z11 = 3 +15 = 18Ω. 8. From the circuits shown in question 1 in question 5, find the combined Z-parameter Z12. Explanation: The Z-parameter Z12 is Z12 = Z12x + Z12y and we have Z12x = 2, Z12y. On substituting we get Z12 = 2 + 5 = 7Ω. 9. From the circuits shown in question 1 in question 5, find the combined Z-parameter Z21. Explanation: The Z-parameter Z21 is Z21 = Z21x + Z21y and we have Z21x = 2, Z21y = 5. On substituting we get Z21 = 2 + 5 = 7Ω. 10. From the circuits shown in question 1 in question 5, find the combined Z-parameter Z22. Explanation: The Z-parameter Z22 is Z22 = Z22x + Z22y and we have Z22x = 3, Z22y = 25. On substituting we get Z22 = 3 +25 = 28Ω.